In the network marketing industry, it is a simple fact that you need to sponsor more people if you are looking to create a residual income with it. But for most people, they stay stuck wondering what to do, and how to get more people involved in their business. Perhaps this is your struggle as well? After speaking to several people on how to sponsor more people in network marketing, I figured I’d create a basic blueprint, or a formula that others could use to help them sponsor more people. 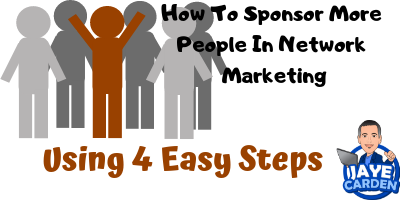 So today, I am going to share with you my personal blueprint on how to sponsor more people in network marketing, with the use of 4 simple steps. First thing to you need to do, is get a grasp on the overall idea of what must be accomplished. The idea behind sponsoring more people into your network marketing business, means you must have massive amounts of people looking at your network marketing business first. Then you need to make sure you are able to cover all the areas needed to get the most from the people who viewed your network marketing business presentation, or who were exposed to the business. This is where many go wrong. There is so much involved if you wish to sponsor more people in your network marketing business. So much, in fact, that many people lose people who would of joined, only if they knew to follow up with them or stay in contact. So with all of these factors involved, I will break it down in a way you can simply follow a few steps everyday, and begin sponsoring more people into your network marketing business. The first challenge in sponsoring more reps into your network marketing business, is to get lead generation working for you. This is where many fall short, but it is actually one of the easiest steps to learn in my opinion. Either way, you aren’t going to sponsor more reps in your network marketing business if you can’t generate leads. So how do we generate these leads? Your main goal and focus is to first generate leads, or everything else is useless. If you are capable now of generating network marketing leads, then you can move to the next area. If you are not able to generate leads, or generating less then 10 leads a day, you need to be focused mostly on getting the leads you need first. If all possible, and your leads leave a phone number for you to contact them on, then it is in your best interest to pick up the phone and call them. If anything in this industry can help you get ahead of the crowd, calling your leads is that thing. Most people are too afraid or scared of rejection, so they never pick up a phone and call anyone. But when you begin to call your leads, you find sponsoring more people into your network marketing business, becomes more possible then ever before. Calling your prospects helps in several ways. It gives your prospect an idea of who you are, making you more than just an email in their inbox. This connection with prospects, is all it takes to get some of them to join your business. Many are looking to get involved in something, but do not know anyone who is sending them emails. So, you become the person they identify with and begin considering working with you. Also, calling your leads helps to place each individual prospect in his or her best list. When you meet people who join, say they are interested in joining later, would like to try the product soon, are involved in another company or whatever the case may be, you are able to place people in the perfect list for future follow ups. As prospects and leads begin to come in, you will quickly realize the madness that you must keep up with or else you’ll lose many of these prospects. This is where you will begin list building, and keeping up with each individual prospect in his/her own way. You do this by using an AutoRespondor or AR. This tool will be one you will not be able to build a network marketing business online, without having. AWeber is the AR of choice for most network marketers. It has the highest delivery rate, and has the best reputation among the ARs available. ARs are used to send emails in bulk, and can save massive time by writing just one message, and sending it to thousands. You can send emails to your team members of an upcoming event, and tell them to invite people to it. You can invite those who have expressed interest in another email, and get more people on the event or webinar. You can promote new products to customers. If not for these lists, you will find you forget who said what, who was interested but needs followed up with. Who said they were going to join starting next month. As you prospect people, be sure you place each one in the appropriate list they would best fit in. This is the most powerful way at converting the leads you generate into signups and sponsoring more people into your network marketing business. If things are beginning to sound a “little over the top”, then you are beginning to see why many don’t sponsor people into their network marketing business. But if you are able to generate leads, break them down into lists to keep up with and communicate with directly everyday, then all you need to do now is schedule your time so you know what you are doing every second of the work day. Doing this can create a huge difference in your results, as silly as it may sound to some. Scheduling your time will keep you from getting distracted, and wasting any time on social media or watching videos. Plus, you schedule your time to focus on what matters. There are many tasks you will be working on, and setting the amount of time needed to accomplish those tasks is why you should be scheduling your day out. If you do not give yourself a set time to get the task completed, you find yourself spending too much time on one area. The idea is to get as much accomplished and be as productive each day as possible. To wrap it all up, this is the most basic step by step way to help the most people with sponsoring more people into their network marketing businesses. How you do each individual step is up to you, and needs to fit your own personal schedule and situation. But if you learn to generate network marketing leads, you have completed one step. Call those leads as they come in, to increase your chances of signing up more people, and to build better relationships with them. Also, this helps you to know where to place each prospect you meet, into their appropriate list. Each list you build, you now have the ability to send follow up emails to. This keeps people reminded of you and the business they expressed interest. It also gives you more power on promoting upcoming events to your team, letting customers know of new products, etc. Last, you need to schedule all of this out over each day. You should always have specific times put aside for specific tasks you work on. This will help you become the most productive you can be, and help to get you a steady flow of new signups in your network marketing business. If you got value, and learned some new ideas from today’s blog post, please leave a comment below. I value your feedback, and look forward to your comment. Also, don’t forget to share this with anyone on your team who may be able to get value from it. P.S Want me to help build you a downline? All you need to do is take this free tour here, and I will place new signups into your own downline, using these same 4 simple steps I teach in this post. See for yourself how well these steps work by having a team built for you with them. 12 replies to "How To Sponsor More People In Network Marketing Using 4 Easy Steps"
I want to start calling leads just need to make sure my telephone bill won’t get crazy. You can get software, or plans that will not charge for long distance calls and even international. Thanks for coming by Shane! I entered my info to learn more. That’s good Phil, hope it helps! I have found for many people who use the internet to run a business, picking up the phone to call anyone is something they will never do. Sadly this costs many of them their businesses in a short while. This is because there is nothing more important in relationship marketing than creating a relationship. The Know, Like, and Trust factor helps people make decisions. Never, and I repeat NEVER try to make a sale on a first call. This is why so many people fail. I have first target people with whom I want to do business, then I use F.O.R.M. to make sure they fit, then I let them become a buyer, instead of selling. It works around 50 percent of the time. It takes sharing real value to those you contact, so make sure you have it. Yes, most will not pick up the phone. I am grateful I got over the fear and did it. Now I have no issue or second thought on calling a lead. Thanks for the comment Dennis, your input is much appreciated! Hello Jaye, I found you on IBOsocial and I wanted to thank you for providing such a useful blog to help marketers improve their lead generation methods. Wishing you much success! We’ll I’m glad you found me too! I appreciate you leaving a comment and visiting! Sponsoring is obviously THE #1 obstacle to success. Your 4 steps provide a clear path to that success. Thanks for the valuable tips, Jaye, it’s why you are the best! I appreciate that Randy! Thanks for coming by! Great advice shared in this blogpost about how to sponsor more people in network marketing. Thanks Tommy, hope it helped!